No Joke. A new ordinance just made it illegal to give money to panhandlers and offenders will face steep fines and even jail time. Wichita, KS— Wichita used to be known as “Cowtown” because of its cattle trade but now if people stop and give something as small as a cheeseburger to a homeless person they run the risk going to jail and paying a $500 fine. The ordinance was recently approved by the city council and now complicates matters for both panhandlers and philanthropic citizens alike. Beat downs and arrests by police are, unfortunately, becoming a larger and larger part of the homeless culture. Not only do police regularly harass the homeless but TFTP has reported on incidents in which officers have confiscated blankets and tents from homeless people in the middle of the winter. Cops in Saginaw, Michigan, who shot and killed homeless Saginaw resident Milton Hall, in firing squad fashion, during a confrontation in a shopping plaza parking lot were told that they wouldn’t face any charges. Who cares about one dead homeless guy, right? Not only are police attacking the homeless but they are also attacking people for helping the homeless. And, as this new ordinance in Witchita highlights, helping those in need can now land you in jail. The police say they see the homeless situation in Wichita as more of a drug and alcohol addiction problem rather than an issue of hunger. Police have even created inter-organizational teams called “HOT” teams, Homeless Outreach Teams. HOT team members offer a hot meal and a warm place to stay but admit most homeless people don’t accept their offer. Often times we see signs say they are a vet and they aren’t a veteran, they say they are homeless, they aren’t really homeless. While Wichita police say their HOT team’s offers of food and shelter to homeless members of society are rejected, there may be a few valid reasons why. First, some police departments have a sordid history of beating up and tasing homeless people. Lastly, other homeless individuals have found themselves in jail for extended periods of time. On one occasion an officer gave a feces sandwich to a homeless man. One homeless man was even attacked by a police K9 for being in a public park asleep. 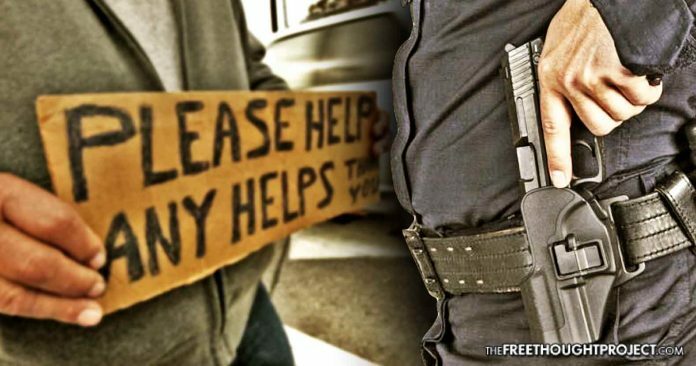 In the eyes of police and the city council, however, panhandlers prey upon the generosity of donors, usually motorists, who stop their cars to give money, food, or other goods. In doing so, the police claim traffic accidents and slow traffic are the results. In an effort to improve the flow of traffic and reduce needless accidents, the city council moved to fine generous citizens, threatening them with big fines and jail time of up to 30 days. That’s America, you’re supposed to have First Amendment rights, but there’s a difference in expressing your First Amendment rights and creating a traffic hazard. When pastors are telling citizens not to help the needy and to accept a violation of rights in the process, something has gone horribly awry in the land of the free. Now, for the voluntary action of handing someone else money, or asking another person for money, cops will arrest you. The City of Wichita made panhandling a misdemeanor, punishable by a fine of $500 and 30 days in jail. The ordinance also fines motorists with the same fines and possible jail time if they choose to give to the homeless. Even if these panhandlers are rich drug addicts who live in high rise apartments, there is no victim in the voluntary act of asking for and giving away money. As impeeding the flow of traffic is already a violation in Wichita, this ordinance makes its purpose entirely clear—continue the war on homeless and those who try to help them, and generate revenue in the process.